Darn, I am not in the market to buy anything at the moment. All my sartorial needs are covered and there is no excuse to buy anything…except, maybe, if pushed I could say I need to buy some new Chucks. The kids are momentarily distracted by Vans which is a perfect time to swoop in and buy their usual choice of footwear for myself (particularly since my last pair were loaned out to my daughter and have been ruined). 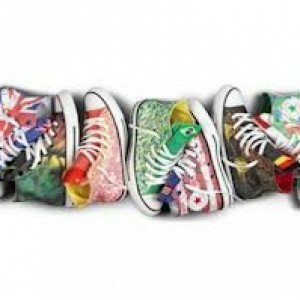 I love Chuck Taylors and love that even here in Air NZ’s Koru lounge there will be someone wearing a pair. This ubiquitous classic was originally an elite basketball shoe, but then over the decades was selected as the footwewar of choice for a number or subcultures including greasers, athletes, punks, grunge rockers, alternative rockers, surfers, Metalheads, rappers, emos, skaters and hipsters. And now it seems business people who don’t want to look like business people and Women Turning Fifty. So you can safely say it’s the universal casual footwear and I simply can’t imagine what you are wearing on your feet in the weekend if you don’t have a pair of Chucks, hopefully not trainers.